Professor Yin Dahui delivering his speech; he advocates media exposure and supervision on medical doctors ‘ tobacco control. Professor Cai Zhongjun, Vice President of the Medical Doctor Association of China , delivering his speech, focusing on the tobacco-related harm to the 2 billion patients every year. Professor Wang Chen, Director of WHO Tabacco or Health Cooperation Centre, delivers his speech, advocating tobacco control for three types of occupation – medical doctors, government staff and teachers. More human infections from bird flu are expected before the spring, with sporadic human-to-human transmissions in China, according to the nation’s top scientists. 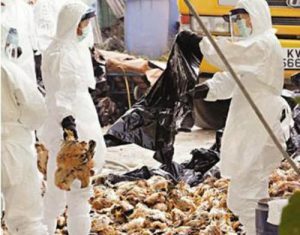 The forecast was made after five human cases of bird flu were reported in Guangdong and Jiangxi provinces and in Shanghai. To date, three deaths have been confirmed from the H5N6 and H7N9 strains of the virus. Shu said that sustainable transmission refers to the easy and continuous secondary and tertiary transmissions of the virus among humans. He said a majority of the human bird flu cases detected so far involved people who had contact with live birds. Of the recent human cases reported, three from Guangdong and one from Jiangxi involved the H5N6 strain. The seven human infections from this strain detected to date all occurred in China. The strain has a fatality rate of 67 percent, Shu said, and was first reported in Sichuan province in May 2014. Ina recent case in Zhaoqing, Guangdong, a pregnant woman with the H5N6 strain had her baby delivered via cesarean section, according to the local health authority. The baby was free from the virus, but the mother remained in critical condition. All her close human contacts were cleared from infection after a period of quarantine. 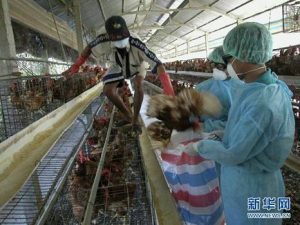 Lu Hongzhou, head of the Shanghai Public Health Clinical Center, said the live poultry trade and markets are mainly to blame for the human infections. He called for live poultry markets to be closed to prevent the virus from mutating and moving from birds to humans via close contacts. 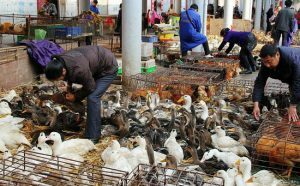 Gao Fu, deputy director of the Chinese Center for Disease Control and Prevention, said such markets act as an “incubator” for different strains of the bird flu virus. Surveillance undertaken by the Ministry of Agriculture showed the H5N6 strain is widespread among farmed poultry – both chickens and ducks – particularly in South China. Humans are susceptible to H5N6 and “contact has to be cut off by closing live poultry markets,” Gao said. The H5N1, H7N9 and H5N6 strains of bird flu have been reported in China to date. On Jan 8, public health authorities in Shanghai confirmed a human case of H7N9 bird flu. The male patient, 59, lives in the city and is being treated at a hospital, the Shanghai Municipal Health and Family Planning Commission said. The H7N9 strain was first reported to have infected humans in March 2013 in China. It is most likely to strike in winter and spring. In meeting with the World Tobacco-Free Day on May 31, the Medical Doctor Association of China announced its Declaration of Chinese Medical Doctors on Tobacco Control in China on its grand event on May 28, 2008. According to the survey of Beijing Disease Control Centre in 2006 to 26,000 medical workers, 15% of the medical workers in Beijing smoke, among whom 42.2% are medical doctors. Some doctors even smoke in front of their patients. As the professional association for medical doctors across China , the Medical Doctor Association of China advocates for a tobacco control campaign among its 2 million doctors. Doctors are encouraged not only to quit smoking, but also to persuade their families and friends to quit smoking. The Medical Doctor Association of China will also work with WHO’s Tobacco or Health Cooperation Centre to jointly advocate for the founding of Tobacco Control Alliance for medical doctors in China with the aim to establish a total tobacco-free environment for medical services in China. Dr. Yin Dakui, President of the Medical Doctor Association of China , announcing the Advocate for the Founding of Smoking Control Alliance for Medical Doctors in China. Professor Yang Jing, Standing Vice President and Secretary General of the Medical Doctor Association of China , announcing the Smoking Control Declaration of Two Million Medical Doctors in China . Dr. England Sarah, WHO Tabacco or Health Cooperation Centre, attended the event and delivered a speech. Dr. Trish Fraser (first right), WHO Tobacco or Health Cooperation Centre, attended the event. As a physician, well aware of smoking hazards to human health, I decided to quit from now on to ensure that the future will never be smoking. As a physician, has the responsibility to persuade my relatives, friends, to stay away from tobacco. At the same time, I have to take a physician social responsibility, to the public to actively publicize the dangers of smoking. As a physician, clinical practice in the day-to-day work, we must fully understand the “tobacco dependence is a chronic disease,” the patient’s tobacco control should be elevated to the high level as well as the treatment of disease, and actively promote smoking cessation and control methods. We are committed to: First contingent of physicians do not smoke and set an example, to tobacco control into the day-to-day work of the clinic, take practical action to push forward the process of tobacco control in China , for human health to create a smoke-free environment to work hard!